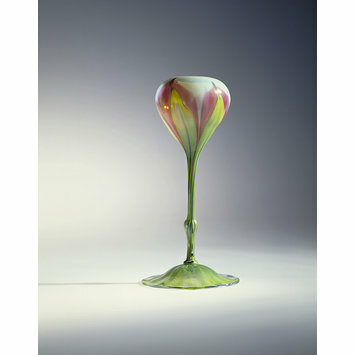 Tiffany Glass & Decorating Co.
'Favrile' was Tiffany & Co's art-glass range. Its name probably comes from 'fabrile', the 'old English' word for 'handmade', indicating that the range was made by skilled glass workers. The historic technique used for this piece involved incorporating coloured canes into the body of the glass and working the glass while it is still hot and malleable. 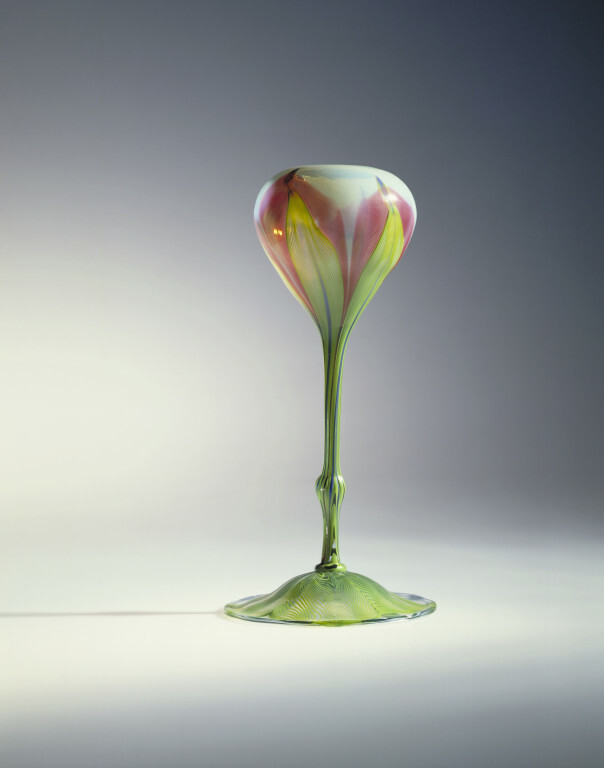 Louis Comfort Tiffany persuaded Arthur J. Nash, a talented English glass blower from Stourbridge, West Midlands, to join him in America to work on experimental projects. In 1893 the two men went into business and established the Stourbridge Glass Co at the Corona glassworks, Long Island, New York. At first the factory made mostly stained glass, but a glass-blowing shop was soon included. It is thought that "Favrile"glass was so-named after the word "fabrile", "old English"for "handmade" indicating that the range was made by skilled craftsmen. The lustre effect was achieved by treating the glass with metallic oxides and exposing it to acid fumes. It was originally intended to re-create the iridescent effects seen on ancient Roman glass. Inscribed "02508"